Living life in the fast lane affects almost every aspect of our lives. Not only does this lifestyle rob us of precious time with family and friends, it also means our meals are rushed as well. That usually means picking up fast food on the way home from work or cooking something super-fast. Those quick meals may taste okay, but do you ever get cravings for those delicious, slow cooked meals like your grandmother used to make? Chances are some of your favorite memories include the image of a large dutch oven on the stove or in the oven, bubbling away cooking good, old-fashioned comfort food. Every good kitchen simply must have a dutch oven. Creating one pot meals is incredibly simple and the slow cooking process means all the flavor and nutrients stay in the pot. It’s also the easiest way to put a hearty meal on the table when cooking for a larger group of people. One dish meals are easy to prepare and there it means a lot less to wash up. If you don’t have a dutch oven, it’s high time you got one. We’ve chosen a range of practical and durable ones so you can choose the best dutch oven to bring out the chef in you. 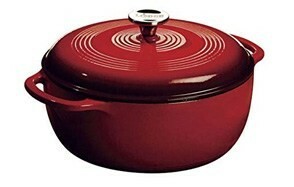 Cook like a pro with this Lodge 6 Quart Enameled Cast Iron Dutch Oven. This is a cast iron pot with a tough, enamel coating that makes cooking a breeze. This enameled cast iron dutch oven will bring to life all of those comforting dishes your mother and grandmother used to make. The heat distributes quickly and evenly so you can get cooking fast, and then lower the heat to a simmer and let your favorite soups and stews bubble away slowly until dinner time. This truly is a one pot cooking masterpiece. You can prepare your meal the night before and stash it in your fridge, then let it cook on the stove or in the oven before bringing it to the table when it’s time to serve your meal. The classic design means you won’t have to transfer the food to a serving dish, so just bring it straight to the table and watch your dinner guests drool in anticipation when you remove the lid. This is a dutch oven that will make the kitchen the heart of the home. 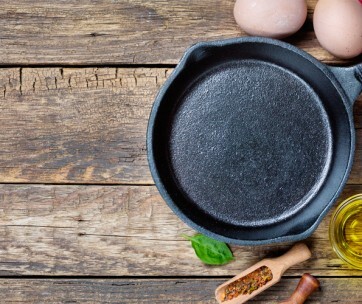 Make sure you also check our guide to the best cast iron skillets. We eat with our eyes first so part of a great meal is presentation. When you serve your family’s favorite dishes in this great Cuisinart dutch oven, you’ll have them eager to start the meal with voracious appetites. The best part of this dutch oven is in its simplicity. It is made from cast iron with a tough enameled coating that heats quickly and retains heat evenly for quick and easy meals, or cooking those low and slow meals that remind us of the good old days when food meant more than just filling a void. The dutch oven has wide handles for easy carrying and you can cook great meals in the oven, the stove top or a broiler. Plus, this good looking dish means not separate plating. Simply take it straight from the kitchen to the table. When you’re done, clean-up is easy as this dutch over in dishwasher safe. Available in classic colors and enough sizes for large and small families. And also makes a perfect gift for foodies in your life. Stovetop, oven and broiler safe. This cast iron dutch oven has a beautiful enamel coating on the inside that won’t react to your food, and a shiny coating outside that will look stunning on any stove top or table. If you loathe messing up your entire kitchen to make dinner then you can get creative with one dish dinners with this AmazonBasics Enameled Cast Iron Dutch Oven. This dutch oven allows you to marinate, refrigerate, cook and serve your meal all in the same pot and the large loop handles make it easy to carry. It is over safe up to 400°F (204°C) so get your culinary imagination started and put something amazing on the dinner table tonight. 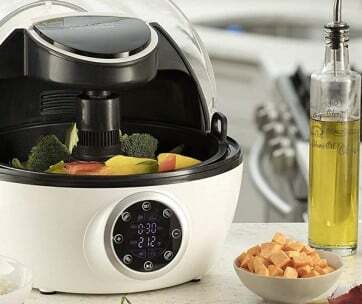 Be sure to also check out our list of the best electric pressure cookers for more great items like this. Free up some space in your kitchen cabinets with this Heavy Duty Pre-Seasoned 2 in 1 Cast Iron Double Dutch Oven and Domed Skillet Lid. Not only do you get a great quality piece of cast iron cookware, the lid of this dutch oven can be used as a skillet so you get the convenience of 2 dishes in one. Plus as the lid or skillet is domed, this would make this dutch over ideal for roasting. This cast iron dutch oven has been pre-seasoned so you can get straight into cooking and the sturdy handles on both the pot and lid make it easy to bring them both to the table, straight from your oven or stove top. You can get your stew cooked in the pot and have a nice steak done in the dutch oven pan. Cook healthy meals, the way they should be cooked in this amazing cast iron dutch oven. Our handy guide to the best rice cookers features more great products like this. If you love the type of dishes you can just set up, put to cook on low heat and almost forget about them until dinner time then this is the dutch oven for you. 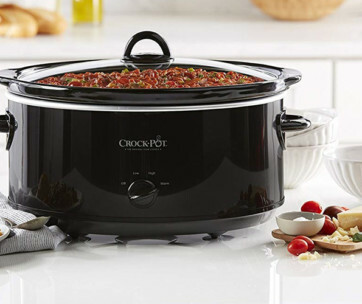 Made from cast iron with a non-stick coating, Crock Pot 69145.02 Artisan 7 Quart Enameled Round Dutch Oven distributes heat evenly and retains it at whatever temperature you set it to. The generous sized handles make it easy to carry around between your fridge, stove or oven, before bringing it to your table to serve the hungry hordes. You can also very easy put a roast in the oven and forget about it as the lid creates a self-basting environment inside the dutch oven so instead of slaving in the kitchen, you can get dinner started and look for other things to do. It’s easy to keep clean and comes in a great range of colors that will complement any kitchen decor. You may also like to check our guide to the best kitchen gadgets. Cook your family an outstanding multiple course meal with this 2 piece Tramontina Enameled Cast Iron Covered Dutch Oven Combo. Having 2 fantastic dutch ovens means you can get a lot more food cooked for large family gatherings. Your guests will think you slaved in the kitchen all day, yet the superior and even heat retention allows you to bring your meals to the boil before setting to a low simmer and relaxing until dinner. These dutch ovens are cast iron with a beautiful porcelain enamel coating and they are compatible with any type of stove top you have. They are easy to carry around, thanks to large, looped handles and the range of colors will make all your food look all the more appetizing. These two dutch ovens are of such a high quality that you’ll spend a lifetime of cooking great meals in these great pots. Love this product? Check out our review of the best electric skillets for our top picks. If you can only take one pot with you when you go camping then you better take this Texsport cast iron dutch oven. This dutch oven has legs on the bottom making it ideal for cooking over a camp fire, and if you’ve got an open fireplace, you can cook a great meal there too. This is a really rugged dutch oven pot that is long lasting and durable so it will last you for a whole lot of years. The lids fits snugly keeping your food warm long after it has cooked, without drying out. The wire handle makes it easy to pick up no matter where you’ve got it cooking and you can cook almost anything you can think of from soups and stews, to hearty roasts and vegetables. You can even bake a beautiful loaf of bread to complete your outdoor meal to perfection. Don’t forget to also check our guide to the best smart kitchen gadgets. Martha Stewart understands the art of good old fashioned home cooking so it’s not surprising to see her name on this Teal Blue Enameled Cast Iron 6 Qt. Round Dutch Oven. 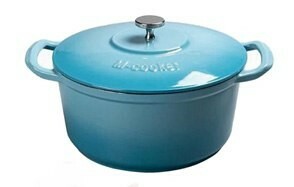 This cast iron enamel dutch oven will become the most used piece of cookware in your kitchen because it is so versatile. You can cook anything from soups and stews, pot roasts and almost any other dish you can think of. The cast iron ensures even heat retention and distribution and the teal blue enameled coating will give your kitchen a touch of timeless charm, especially when you prepare one of your family’s old classic dishes. The handles are nice and large for easy handling and the heavy duty construction is your guarantee of a good quality, long lasting dutch oven. Large enough for big families and ideal for cooking and serving. Find more great products like this by checking out our guide to the best meat thermometers. Dutch oven cooking has never been simpler with pre-seasoned cast iron. Victoria DUT-304 Pre-Seasoned Cast Iron Dutch Oven heats quickly and retains the heat for even cooking. The tight fitting lid locks in moisture so your food stays perfectly moist and melt in your mouth. It has an oven safe stainless steel know and large ergonomic handles and so endurable, you’ll most likely never need to replace it. This dutch oven allows you to cook on any heat source from gas, electricity and even an open fire. You’ll be able to cook anything in this dutch oven so pull out all of those old recipes you never thought you’d be able to cook, or come up with some of your very own culinary masterpieces. When you’re done you can bring your dish straight to the table as this dutch oven looks just as good on your table as it does on your stove. Another great guide we prepared is to the best indoor grills so check it out. The best enameled cast iron dutch oven is one that cooks your food evenly and looks stunning when you bring the food to the table. Unicook Enameled Cast Iron Dutch Oven 5 Quart is compatible for all types of cook tops including gas, electricity or you can even use it to cook something amazing in the oven. The heavy duty cast iron construction makes this an incredibly durable piece of kitchen ware that you will use for all of your soups, sauces, stews and a whole lot more. The large handles make for easy carrying and handling and the superior heat retention means you can enjoy cooking all of those incredibly tasty old style meals that require slow, consistent cooking for amazing results. Our guide to the best air fry0000000000000000000000ers offers more great products like this so check it out. The easiest way to get a substantial meal on the table for a lot of people is to make something hearty in a large dutch oven. This M-Cooker 7 Quart Enameled Cast Iron Pot with Self Basting Lid is extremely versatile so you can cook on any stove top or in the oven. The exterior is available in trendy, bright colors and its dishwasher safe so you can take a break from washing up. This dutch oven heats quickly and retains an even level of heat distribution so you can cook all those scrumptious old style meals that you remember slow cooking at your grandmother’s house. It also comes with a few handy accessories to make your cooking experience easier than even. This is a premium dutch oven you will never put away in your cupboards because you’ll be thinking of ways to use it every day. Superior heat retention and even heat distribution. Brand – When looking for a good dutch oven, we looked at manufacturers or brands with a reputation for producing exceptional cookware. Of course, when it comes to dutch ovens, particularly those featuring cast iron, you can sometimes get away with purchasing an unbranded one. However, if you’re not sure of what to look for, sticking to a tried and trusted brand name is often the better and safer choice. Some of the brands also feature the name of a celebrity chef who actually uses that particular brand because they know it will cook many different types of dishes to perfection. This is also a good indication of a product worth looking at purchasing for your kitchen. Reviews – The customer experience is always worth checking out when looking at a particular product and that is why reviews are a good place to start when shopping for a product like a dutch oven. We checked several reviews to see which products were the most favorable, but we also believe you can learn a lot about a product by checking average and negative reviews. These areas highlight what may not be good about the product. Of course, that doesn’t mean there is anything wrong with the dutch oven. All customers have certain expectations when they purchase a product and it could just be that a few of these expectations may not have been met. Check out the reviews for yourself and you’ll be sure to get a better insight into the products, paying particular attention to how you expect the product to perform. Price – Fortunately, dutch ovens generally don’t fall under enormous price tags. However, some are obviously more expensive than others. The dutch ovens in our selection range from budget models to top of the range ones. The good news is, that even the dutch ovens at the lower end of the price range will still perform extremely well and will also last you for quite a long time. Quality – It’s often quite challenging to choose one piece of cookware from the endless choices on the shelves and online. However, a good quality dutch oven should last you a lifetime. If you were lucky enough to have a childhood that involved Sunday lunches at your grandparents, you probably remember the old dutch oven on the stove. What’s more, you probably noticed that it was always the same dutch oven. That’s because of the quality. A good quality dutch oven is usually made from durable materials that will stand the test of time and become an important part of the average family kitchen. When we put together our selection of dutch ovens, we looked at the quality first. Nobody wants to be constantly replacing their cookware and the best dutch oven is one that only gets better, the more you use it. Cast Iron – This durable material has been used in cookware for centuries. Cast iron is relatively inexpensive and it can last for a lifetime, possibly longer. The main thing to remember with cast iron is that it needs to be seasoned. 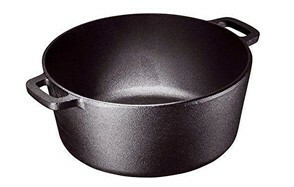 To season a cast iron pot, you need to wash it and dry it really well. Then apply a thin layer of vegetable oil or shortening over the dutch oven before applying heat. This can be done in the oven or over hot coals. Once seasoned, you can cook any type of food you like in your dutch oven. Just remember to clean it each time and apply a thin layer of oil or shortening after each use. If you forget to do this, you can usually re-season your dutch oven quite easily. Cast iron is quite heavy, but it is the heaviness that allows for the heat to be so well retained during cooking. Enameled Cast Iron – As the name suggests, an enameled cast iron dutch oven is made from cast iron with an enameled coating. This material is usually a little more expensive than cast iron alone but the enamel coating means the pot does not need to be seasoned making it easier to use. It is just as sturdy and heavy as a regular cast iron dutch oven, however, keep in mind that enamel can crack and that can compromise the quality of your dutch oven. Ceramic – A ceramic dutch oven can be used in much the same way as cast iron or enameled cast iron. However, ceramic can crack or break quite easily. Ceramic does look stunning to serve food in and you can still develop great flavors with your cooking. Other Metals – Dutch ovens can also be made from a variety of metals such as aluminum or stainless steel. Some are enamel coated, while others aren’t. However, it is important to remember that some metals react with acidic foods and may not be suitable for some dishes. Some of these metals leach toxins and they will end up in your food during the cooking procuess. If you do purchase such a pot, you may need to throw it out if it becomes scratched or damaged in any way. Enamel – Many different types of cookware these days are enamel coated. This has proven particularly beneficial with some types of metals as the enamel prevents any toxins from seeping out of the metals into the food. When it comes to enamel coated cast iron dutch ovens, this coating provides an easy to clean surface on the interior and exterior of the pot. Porcelain enamel refers to cookware with a glass type material that is bonded to the metal giving you a safe, durable and non-stick surface. The main benefit of choosing an enamel coated dutch oven is that you don’t need to season the pot before you use it. It is easy to clean and maintain so you can literally store your dutch oven anywhere in the kitchen. Enamel coated dutch ovens also look amazing and you can choose a variety of stunning colors that will look beautiful on your stove top or table. Handles – Dutch ovens can be quite heavy, particularly cast iron ones. That means you will need sturdy handles in order to carry your dutch oven from the stove to the table. Some dutch ovens come with solid handles that can be easily gripped with pot holders, while others have looped handles that are very easy to grab a hold of. Some of the cast iron outdoor dutch ovens have a wire handle that makes it very easy to lift the pot from a camp fire or fireplace. Look at the different types of handles available and choose the one that you find most suitable for the type of cooking you intend on doing. Lid – Every good dutch oven must have a good lid. After all, the beauty of the dutch oven is to cook food in a closed pot to retain all the nutrients and flavor of the dishes you are cooking. Look for a lid that fits snugly over the top of the dutch oven, making sure the handle is well positioned and easy to grasp when you want to remove the lid to serve your meal or check its cooking progress. The handle of the lid can be made from any type of metal as they don’t come in contact with the food. Similarly, some dutch oven lids are domed and feature handles just the same at the pot itself. This is quite handy as you can then use the lid as a dutch pan or skillet. You can very easily cook two separate dishes and serve them in both the pot and the lid. Shape – You can generally find dutch ovens in two different shapes. Round or oval. Both are equally beneficial when it comes to roasting or baking. However, an oval dutch oven is probably more suitable for a roasting a large, long piece of meat with the accompanying vegetables. On the stove top, the oval shape is not very practical as it will take up a lot of space and you may not be able to cook anything else next to an oval pot. In terms of heating, both an oval and round dutch oven will heat evenly, however, the oval one may not have the same heat distribution as a round one due to the absence of heat at the edges of an oval dutch oven. A round dutch oven will be perfect for both the stove top and the oven as it will heat evenly all around and maintain the same level of heat throughout. If you are cooking over a fireplace or a camp fire, both the oval and round dutch ovens will cook your meals to perfection. Once you start cooking with a dutch oven, you’ll never look back. There are so many different types of dishes you can make such as soups, stews and casseroles, all with amazing sauces. You can also make mouth watering roasts and breads that will have your family satisfied at every meal. Choose a long lasting, good looking dutch oven from those in our selection and start creating amazing meals that your family and friends will love. You may start by making those old family favorites, but it won’t be long before you let your imagination run wild with spectacular signature dishes of your own. If you love cooking, a great dutch oven will definitely bring out the chef in you.